Carolina and Martin have been together for about 15 years. They have 2 children, Carlo, age 7, and Carolay, age 4 - who was enrolled in the Compass Children’s Center educational program. In November of 2015, the family lost everything in a devastating fire, which destroyed asthma medications for the children, important documents, toys, clothes, furniture, photos and all their memories they had collected over the years. After getting in touch with a Compass Clinical Coordinator, the family received counselling services to deal with the trauma of losing their home. They applied to different types of housing, including a housing lottery, where they were chosen to receive a 1 bedroom unit in a new building in San Francisco. At this time, Compass RAP was able to provide them with move in costs and aid them with new furniture. The family moved into their new home before the fire’s first anniversary. Today, they are settled, and their daughter Carolay has graduated from Compass Children's Center, and is looking forward to the next phase of her education. 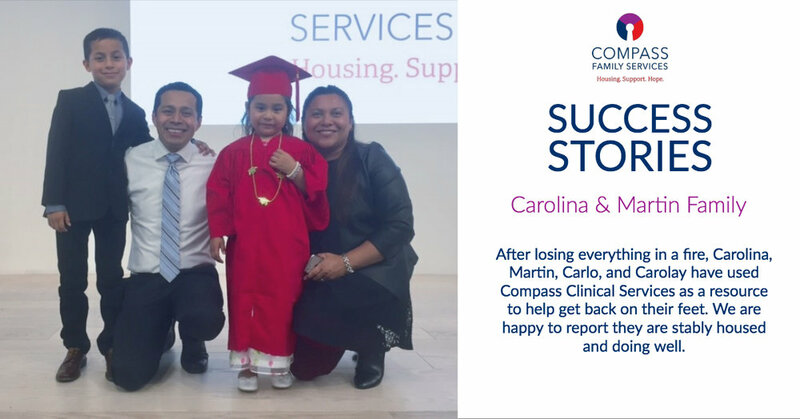 Compass Family Services achieves success with our clients through multiple different programs, including Clinical Services. Family Well-being is immensely important to us, and in 2017 we provided 2753 mental healthcare sessions to our clients. 95% of clients attending at least three mental health sessions reported having an overall improvement in their mental health and functioning. None of our programs would be possible without volunteers, donations or city support - so thank you to our donors and volunteers! It doesn’t take much to make a huge difference. Compass Family Services has an automated monthly donation program, where you can choose how much you would like to donate every month, with the option of opting out anytime. Donate today!